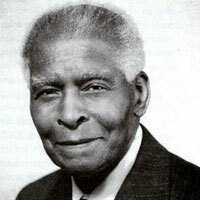 March 28, 1984 Benjamin Elijah Mays, minister, educator, scholar, and social activist, died. Mays was born August 1, 1894 in Ninety Six, South Carolina. He earned his Bachelor of Arts degree from Bates College in 1920 and his Master of Arts degree in 1925 and Ph. D. in the School of Religion in 1935 from the University of Chicago. He was ordained a Baptist minister in 1922. From 1934 to 1940, Mays was the Dean of the School of Religion at Howard University. In 1940, Mays became President of Morehouse College where he served as a significant mentor to Martin Luther King, Jr. After his retirement in 1967 from Morehouse, Mays was elected President of the Atlanta Public Schools Board of Education where he supervised the peaceful desegregation of Atlanta’s public schools. In 1982, Mays was awarded the NAACP Spingarn Medal. After his death, Mays was entombed on the campus of Morehouse. His autobiography, “Born to Rebel: An Autobiography,” was published in 1971. A public school in Atlanta is named in his honor, Benjamin E. Mays High School.